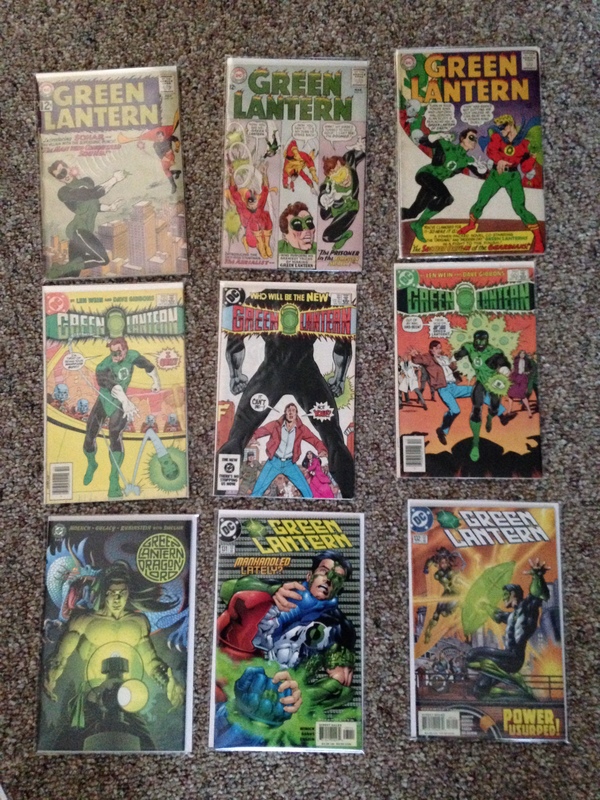 A small assortment from my Green Lantern Collection. Collect every single issue of Green Lantern! It sounds strange, I know. Focusing on just one title. Other people have stranger hobbies. Some people collect fishing hooks. Others collect pop (soda) cans. I knew someone who, for a short time, collected beer cans from the 50’s! But, Green Lantern is my all time favorite super hero! A Green lantern’s power is limited only by his Will power and imagination! Yeah, yeah, I know… the color yellow. Well, they fixed that when everyone realized that the Fear entity, Paralax, was imprisoned within the main Power Battery on Oa, and the Guardians did an upgrade on the Rings to make them work on the color yellow! I am passively active in my collecting, if that even makes sense. I’m not on eBay trying to find people selling entire collections or anything like that. I’m periodically stopping by my local comic shops to see if they have any issues that are unique or if they have any sequential issues. Did you know that Dark Horse did a 4 issue run of Green Lantern vs Aliens? Yeah, neither did I until I found issue 2 of 4 at 2nd and Charles! Basically, the Green Lantern Corps put Xenomorphs on Mogo, the sentient planet that is a Green Lantern, because he is uninhabited. In issue 2, it isn’t really explained why the Corps came into possession of the Xenomorphs, but a mining ship crashed landed on Mogo sometime after Hal Jordan destroyed the GL Corps and former Lanterns sought out Kyle Rainer to basically, clean up their mess. This is the kind of discovery that excites me about collecting one specific title of super hero! 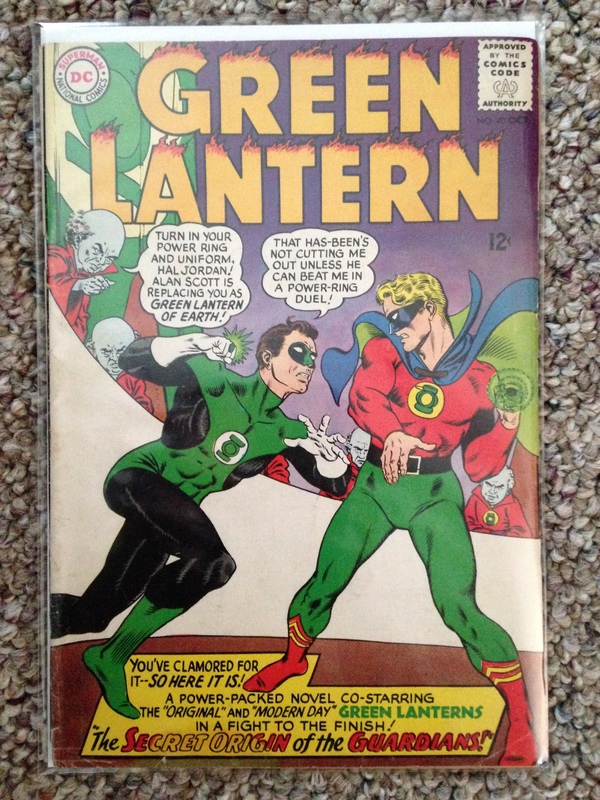 A mind controlled Alan Scott faces off with Hal Jordan in this October 1965 classic! I have found that while looking through Green Lantern issues, I have an overwhelming urge to put them in order, especially if I have found that a lot of them are sequential, or close to it. I find myself organizing the issues by series, volume and issue. 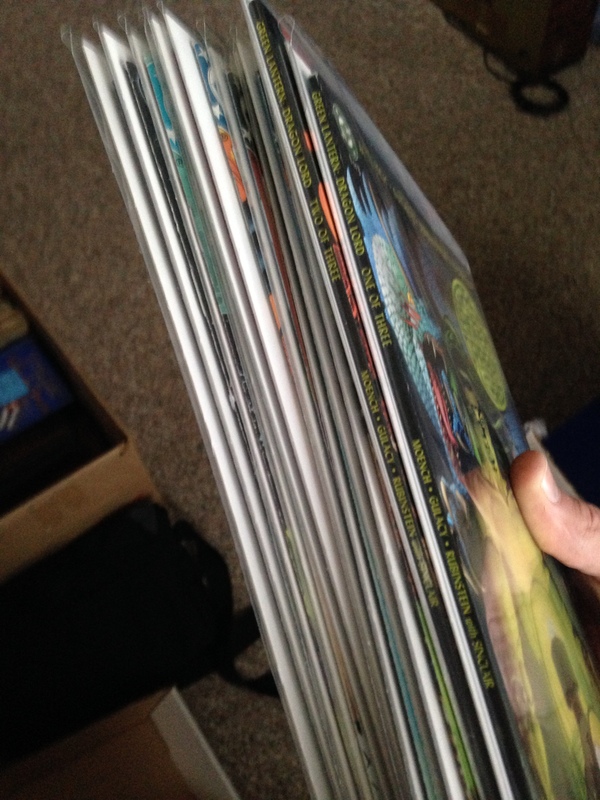 I understand having a lot of back issues and it would be rather time consuming to put every issue in order… but, at least places could make an effort! If comics are somewhat organized, then people might buy more because some are in order. Stores, at least, have back issues in order of title. The two Comic Cons I have been to, more often than not, vendors have comics in no discernible order. And every box is packed so tightly, that you run the risk of damaging a single issue if you dare try to see what it is. At the time of this writing, I have a total of 83 issues of Green Lantern, including a few trade paperbacks that have multiple issues within them, that I am planning on swapping out for the physical issues. The oldest issue that I have is Green Lantern Vol. 2 issue 14 dating July 1962 and the newest issue that I have is Green Lantern: New Guardians issue 32 August 2014 (Thanks Dad!) I was originally not going to look for any of the Alan Scott Green Lanterns (the FIRST Green Lantern from the 1940’s) because I personally didn’t like the character, but then I got to thinking… That would be the next step once I get all of the modern GL issues. So, I am not overly actively looking for the Golden Age GL. 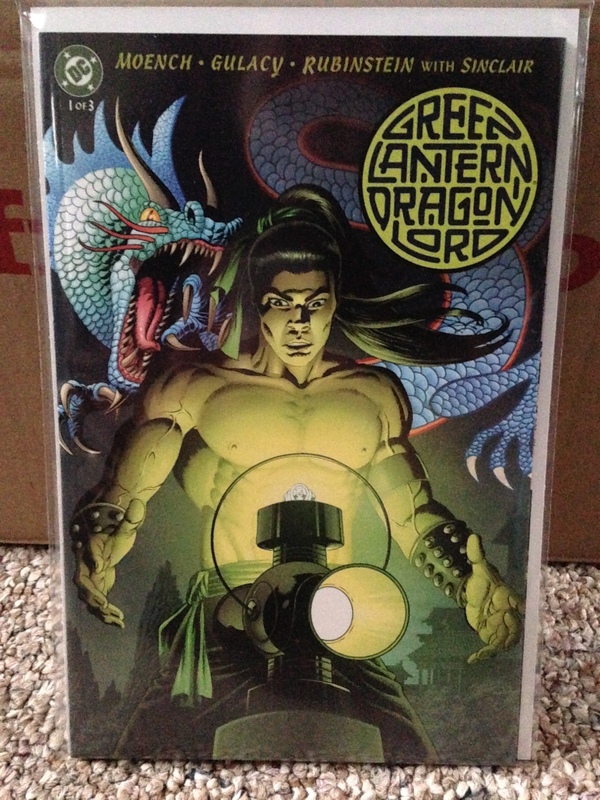 Green Lantern: Dragon Lord is a title that I never knew existed! With all these comics, buying duplicates could become an issue (get it?!). After looking around the interwebz for a comic collecting database program, and trying some that pretty much didn’t work for me, I found one that works! At Derby City Comic Con, I met a fellow who showed me an app called CLZ Comics. He showed me a little bit about how it works and what all it could do. I made note of it and looked it up when we got back home. I downloaded the 100 issue free trial and began to catalog my collection. After seeing what the program could do, I paid the $14.99 for the iPhone app and ported everything over via the CLZ Cloud. Now I always have my collection in my pocket when I’m out and about! And once I reach the 100 issue limit on the desktop program, I plan on buying the full licence so I can easily print out lists and what-not. The stack of issues I have yet to read. Out of 83, that’s not bad! Collecting comic books is becoming a fun hobby. I am learning so much about not only Green Lantern, but the entire industry as a whole. I am learning about grading comics and what various artists contribute to a character when they are given control of the title. I am looking forward to not only expanding my collection over the years, but also expanding my knowledge of comics as a whole. Great title. Sounds like a fun hobby. I’m glad you’re reading them and not just putting them in a box. Where’s the fun in owning something if you don’t get to enjoy it? Except for the stack pictured, and the issue from 1962 (which I am currently reading in digital form since the issue isn’t in the best of shape), I have read every issue in my collection. I also love the smell of old comics! Print is meant to be enjoyed, in my opinion. Thanks for reading!